June 2008. 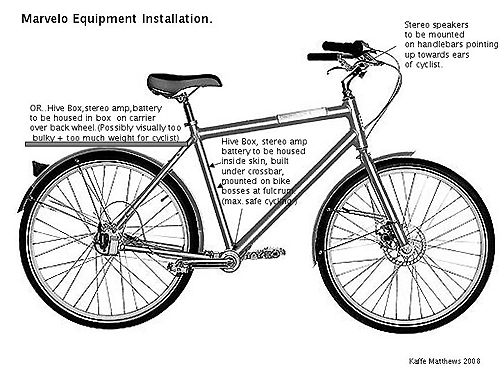 The Marvelo Bikes are second hand bicycles carrying a stereo sound system, Hive Box and GPS receiver. 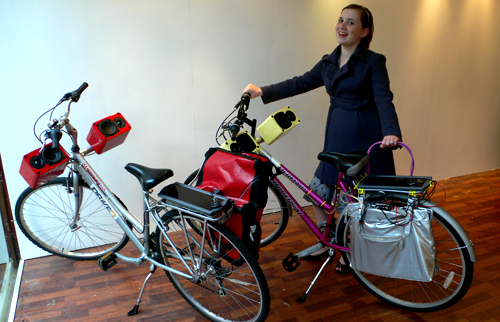 The design to securely carry this kit on moving bikes is as essential as the reliably functioning technology. The Hive Box is a small computer beating at the heart of the Marvelo Project. Enabled through a collaboration with Alexei Blinov and Wolfgang Hauptfleisch of Hive Networks, it contains the music as sixty seven mp3’s made by the Marvelo Team, each piece being linked to a specific location in Folkestone via GPS. Cycling through that zone will then trigger that piece to play. Negotiating audio quality against accurate triggering and cross fades against hard drive power as well as the requirement to reliably run the entire kit from a battery for eight hours daily for three months is challenging work. Fortunately Gavin Gav and Lisa Hall are on hand in Folkestone fixing and maintaining the work on the road. Peter Edwards’ innovative Marvelo mapping tool was also an essential ingredient to this success, enabling quadrants to be drawn on digital maps producing GPS grid references for the Team to link their mp3’s to chosen points in the town. The installation of the Marvelo audio system, researched and designed by Kaffe, was enabled through a collaboration with David Cranmer who designed sturdy steel cross pieces to house the speakers. 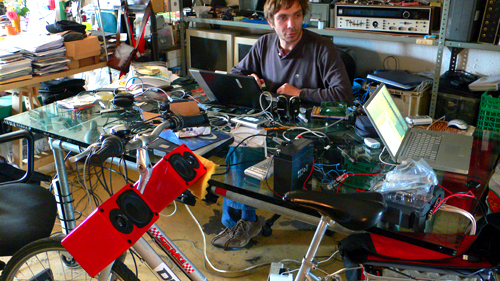 Thanks to Alexei and Wolf, David and Pete a successful MkI Marvelo system was built.